The Charlotte Partridge Ordway Japanese Garden is a living symbol of the peace and friendship that exists between Saint Paul and its sister city Nagasaki, Japan. A renowned landscape designer in Nagasaki, Masami Matsuda, created the garden according to time honored Japanese design principles using plants and trees that are hardy in Minnesota. Infused with true Japanese design, the garden is meant to delight your senses. The Japanese Garden is approximately from April through the beginning of November (weather dependent). The garden’s design was a gift from the people of Nagasaki, St. Paul’s sister city, to the people of St. Paul. It was designed by Masami Matsuda, landscape architect from Nagasaki, as a peaceful retreat. Mr. Matsuda, however, gives credit to nature for the garden’s creation. Funds were donated by the family of Mrs. John G. Ordway. It was opened to the public in 1979, and completely renovated in 1990-1991 under Mr. Matsuda’s direct supervision. 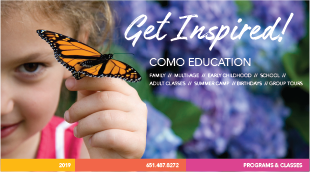 In the 2001 Como Friends launches an $8.5 million capital campaign to improve the garden. In November 2008, a City of St. Paul Landscape Architect presents the Ordway Gardens plan to Masami Matsuda in Nagasaki. In the spring of 2012 is renovated under the direction of a renowned Japanese Garden specialist, John Powell. In 2013 the Charlotte Partridge Ordway Japanese Gardens reopens. Click HERE for more information about the elements in the Garden. The objective of a Japanese tea ceremony is relaxed communion between host and guests. It is based not only on the etiquette of serving tea, but on the precise performance and aesthetics of the centuries-old ritual, the beauty of the utensils, the simplicity of the surroundings, and the social aspects of experiencing the ceremony with others. All of these elements coexist in a harmonious relationship with the ceremony. The ultimate aim is the attainment of deep satisfaction through silent contemplation and the drinking of tea. An authentic Japanese tea ceremony can last many hours. Built in the style of a traditional Japanese teahouse, Como’s teahouse is made primarily of materials indigenous to Minnesota, and expresses pure Japanese taste. Its aesthetic intent addresses not a spirit of deficiency but of poverty freedom from external concern and awareness of essential inward values. Equally important is the spirit of tranquility. Together they reveal beauty in imperfection and insufficiency. For the Japanese people, a teahouse and garden represent a mountain sanctuary within the city. The teahouse and gardens are our mountain sanctuary. Through participation, guests set themselves apart from the cares of the world. One approaches the teahouse and its gardens by way of a gate, leaving the outside world behind. Only participants of the tea ceremony enter the inner secluded garden. This is not a large landscape scene. Dramatic views or unusually fragrant plants are not included. Simple, natural arrangements of trees and green leafy plants are desirable, as is foliage that makes a sound in the breeze. Guests experience the details of the garden before entering the tearoom. Carefully placed stepping stones form a short path in the garden. They encourage introspection, bringing attention downward as you prepare to enter the tearoom. Final preparation involves the washing of hands and touching the mouth at a special small stone basin called a tsukubai, which means ‘to crouch.’ While washing, one crouches on the flat smooth stone or mai ishi, which is one of the many stones placed around the stone basin. After meditative preparation, you enter the tearoom by crawling through a small, low entrance, which brings you to an area that is in every way another world. Subdued lighting and the fragrance of incense greet you. The room is free of decoration except for the alcove, or tokanoma, set aside as a place of honor. A simple flower arrangement and a hanging scroll establish a tone of quiet, transient beauty for the gathering. All the hosts of the tea ceremony volunteer their special skills. At least one certified tea instructor is present with a staff of other volunteers, who have studied tea for many years. The tea ceremony they perform has been taught in Japan from generation to generation by the Urasenke branch of the Sen family. We are most fortunate to have the support of these devoted individuals. The tea ceremony at the Charlotte Patridge Ordway Japanese Garden lasts 45 minutes, and includes an explanation of the ceremony itself. The cost of a tea ceremony is $40, of which, a $5 donation is being made to Chado Urasenke Tankokai Minnesota Association (Yukimakai) to help in the recruiting and training of new tea students so they may continue their long tradition of presenting the Japanese Tea Ceremony (Chanoyu) to the public at The Charlotte Partridge Ordway Japanese Garden. If you would like more information about opportunities to study and learn about the Chanoyu you can contact Yukimakai at YukimakaiMN@gmail.com. Thank you and we hope you enjoy your experience. Free shuttle bus service from the District Service Center located at 1930 Como Ave. Check back for information on advanced ticket sales! Bonsai, martial arts, singing, dancing, drumming, delicious food and other aspects of Japanese culture, will be featured at the annual Como Park Japanese Obon Festival, a family-friendly event, reminiscent of Japan’s annual Obon holiday, on Sunday, August 18, 2019 on the grounds of the Marjorie McNeely Conservatory in Como Park from 3:00pm – 9:00pm. Obon is an important Japanese cultural and family holiday, at which ancestral spirits are said to revisit their families for three days. Families pay their respects at grave sites and put out offerings of food and drink on a tray before household altars. They also light lanterns or small fires outside the house to symbolically guide the souls to the home. On the last evening of Obon, lanterns again guide the spirits back to their resting places. The Obon Festival encompasses Japanese tradition—through music, dance, crafts, martial arts and lanterns. Entertainment in the Como Ordway Memorial Japanese Garden and on the main stage will include several taiko drumming groups, koto (Japanese zither), shakuhachis (bamboo flutes), traditional and contemporary dance and singing. Martial arts, Ikebana (Japanese flower arranging), origami demonstrations and a host of other cultural exhibits and demonstrations will line several paths through the grounds. Japanese food and dozens of culturally-related items will be for sale. The day will culminate at dusk with the main event—the lantern lighting. Six stone lanterns and floating paper lanterns throughout the Japanese garden pond and the Frog Pond will create a vision of peacefulness and harmony to commemorate the dead. 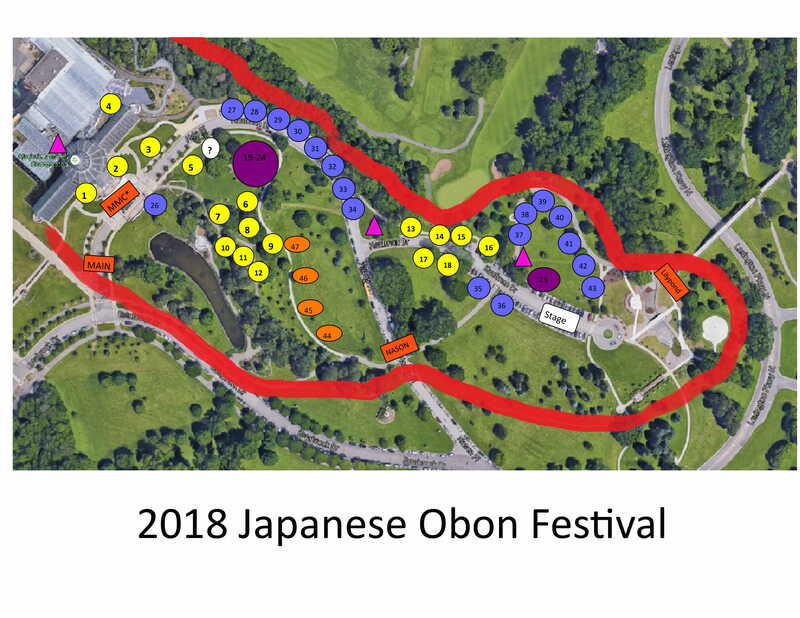 The Como Park Japanese Obon Festival, produced by Como Park Zoo and Conservatory, Japan America Society of Minnesota, and Saint Paul Nagasaki Sister City Committee will be held on Sunday, August 18, 2019 from 3:00pm-9:00pm. 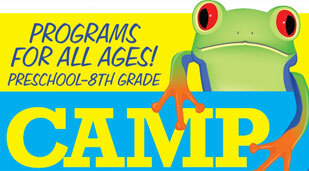 Admission is $5.00 per adult (13+), $3.00 per child (ages 3-12) and Seniors (ages 65+), free for children under 3. Free shuttle bus service will be available from a staffed off-site parking lot at the District Service Center located at 1930 Como Ave. The Japanese Obon Festival is reminiscent of Japan’s annual Obon holiday, an important cultural and family event. During this holiday it is said that ancestral spirits revisit their families for three days. Many people will return home to pay their respects at grave-sites, and often small paper lanterns are lit and floated down the river to guide ancestor’s spirits. So, it’s all about Lanterns? The Festival encompasses Japanese tradition—through food, music, dance, crafts, martial arts and yes, lanterns. Eat Japanese food, watch children play games while the parents learn more about Japan at the various booths, view traditional Japanese entertainment on the main stage, and lose of few calories by dancing the Bon Odori, the finale of the program. Then, at dusk, stroll over to the pond and view the lanterns floating on the water. Can I launch or buy a Lantern? The Saint Paul-Nagasaki Sister City Committee will be selling Obon Lanterns at their booth location this year – visitors who purchase them are welcome to either take them home OR bring them to the Lily Pond for a Como Volunteer to launch into the Lily Pond any time during the festival. If a lantern is launched by one of our volunteers, guests will not get them back. Only Como volunteers are permitted to launch lanterns. What’s new? It has been so crowded in the past! We are continuing the expanded layout of 2016 which allows guests plenty of room to spread out. Advanced tickets are available until Noon on Sunday. If you’d like to skip the line you can purchase advanced adult tickets by clicking HERE. Advanced children and senior tickets can be purchased HERE. If you do purchase advanced tickets, the main entrance, to the South of the Conservatory will have a designated entrance for you. Look for the signs near that entrance. You can also enter any of the other gates if you have your printed out receipt or photo ID. Tickets will also be available at the door. We will have 4 entry gates this year opening at 3pm. See the layout below. Credit cards for the entry fee will be accepted at the Main gate only. Food vendors only accept cash. Sorry, except for service animals, no pets will be allowed on the grounds. What time do they light the Lanterns? 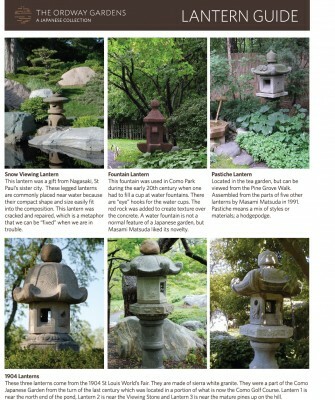 Lantern Lighting will begin at approximately 8pm in both the Japanese Garden and Frog Pond. Lanterns will be in the Lily Pond all day. The day culminates with the lantern launching at 8pm. Vendors also close at 8pm. Parking will likely be a challenge for our area with the higher number of visitors attending. Along with our parking lots we have an off-site shuttle lot located at 1930 Como Avenue which will likely fill up fast as well. We highly suggest if you are coming out to the festival to take advantage of the free Metro Transit passes, or consider using taxi services, Uber or Lyft. How long does the Shuttle Run? Are Wheelchairs or Strollers Available? The Garden Safari Gifts booth near the conservatory entrance will have a few wheelchairs to rent, but no strollers. Why is the Japanese Garden Closed? The Japanese Garden will be open all day then close from 6:00pm-8:00 to prepare for the lighting of the lanterns in that area. The gate to the Japanese Garden will re-open around 8:00. Please, no flash photography in the garden when it reopens. I want to become a vendor. Who should I contact? 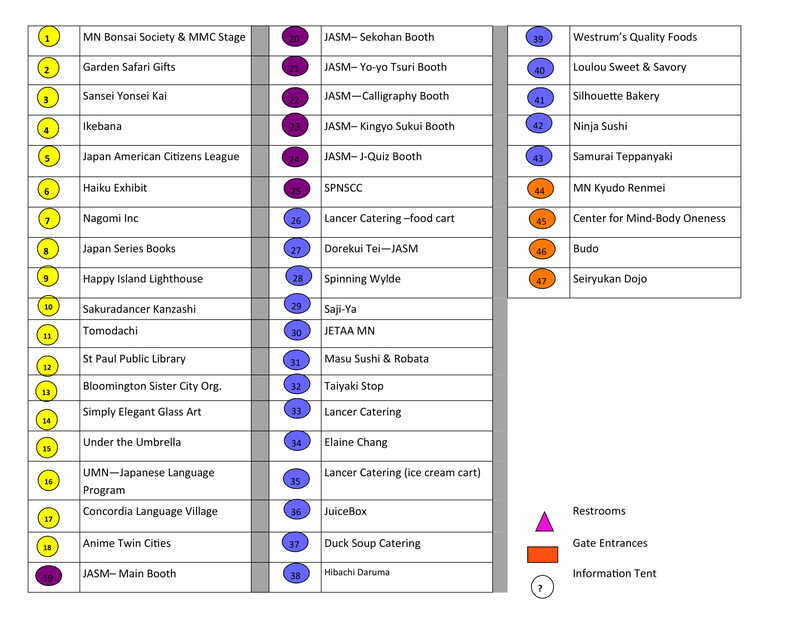 All new vendors have to be vetted through our planning committee. You can start the process by emailing our Events Coordinator at lindsay.sypnieski@ci.stpaul.mn.us with a synopsis of your group and what your booth will be promoting at this year’s festival.